Definition at line 48 of file llimpanel.h. Definition at line 99 of file llimpanel.h. Definition at line 102 of file llimpanel.h. Definition at line 51 of file llimpanel.h. Definition at line 225 of file llimpanel.cpp. References LLVoiceClient::addStatusObserver(), LLSingleton< LLVoiceClient >::getInstance(), llendl, llwarns, mNotifyArgs, mSessionName, and sVoiceChannelMap. Definition at line 243 of file llimpanel.cpp. References gVoiceClient, mSessionID, mURI, LLVoiceClient::removeStatusObserver(), sVoiceChannelMap, and sVoiceChannelURIMap. Reimplemented in LLVoiceChannelGroup, LLVoiceChannelProximal, and LLVoiceChannelP2P. Definition at line 392 of file llimpanel.cpp. References callStarted(), getChannelInfo(), mState, sCurrentVoiceChannel, setState(), STATE_CALL_STARTED, and STATE_NO_CHANNEL_INFO. Referenced by LLVoiceChannelP2P::activate(), LLVoiceChannelProximal::activate(), LLVoiceChannelGroup::activate(), deactivate(), setChannelInfo(), and LLVoiceClient::setVoiceEnabled(). Definition at line 367 of file llimpanel.cpp. Referenced by LLVoiceChannelP2P::activate(), LLVoiceChannelProximal::activate(), LLVoiceChannelGroup::activate(), activate(), LLVoiceChannelProximal::deactivate(), LLVoiceChannelGroup::deactivate(), deactivate(), LLVoiceChannelP2P::handleStatusChange(), handleStatusChange(), LLIMMgr::inviteToSession(), LLVoiceChannelProximal::isActive(), isActive(), and LLVoiceChannelP2P::setSessionHandle(). Reimplemented in LLVoiceChannelGroup, and LLVoiceChannelProximal. Definition at line 372 of file llimpanel.cpp. References activate(), callStarted(), LLSingleton< LLVoiceChannelProximal >::getInstance(), mIgnoreNextSessionLeave, mState, sCurrentVoiceChannel, setState(), STATE_HUNG_UP, STATE_RINGING, and TRUE. Referenced by LLVoiceChannelGroup::deactivate(), LLVoiceCallCapResponder::error(), handleError(), handleStatusChange(), setChannelInfo(), and LLFloaterIMPanel::~LLFloaterIMPanel(). Definition at line 430 of file llimpanel.cpp. Referenced by LLVoiceCallCapResponder::error(), LLIMMgr::inviteToSession(), and LLVoiceCallCapResponder::result(). Definition at line 444 of file llimpanel.cpp. 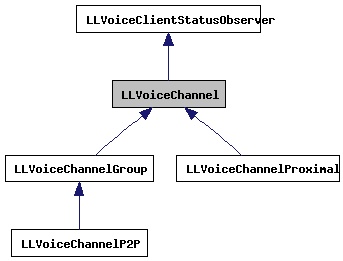 Reimplemented in LLVoiceChannelGroup, and LLVoiceChannelP2P. Definition at line 420 of file llimpanel.cpp. References sCurrentVoiceChannel, setState(), and STATE_CALL_STARTED. Definition at line 83 of file llimpanel.h. Referenced by LLVoiceRemoteCtrl::draw(), LLFloaterChatterBox::draw(), LLFloaterChatterBox::getCurrentVoiceFloater(), LLVoiceClient::setVoiceEnabled(), and LLActiveSpeakerMgr::updateSpeakerList(). Definition at line 77 of file llimpanel.h. Referenced by LLFloaterIMPanel::draw(), and LLFloaterChatterBox::draw(). Definition at line 355 of file llimpanel.cpp. References deactivate(), setState(), and STATE_ERROR. Referenced by LLVoiceChannelP2P::handleError(), LLVoiceChannelProximal::handleError(), LLVoiceChannelGroup::handleError(), and onChange(). Definition at line 308 of file llimpanel.cpp. References callStarted(), deactivate(), FALSE, LLPanel::getHandle(), LLPanel::getPanelByHandle(), LLViewHandle::isDead(), LLViewHandle::markDead(), mIgnoreNextSessionLeave, mLoginNotificationHandle, mNotifyArgs, setState(), LLNotifyBox::showXml(), STATE_CONNECTED, STATE_RINGING, LLVoiceClientStatusObserver::STATUS_JOINED, LLVoiceClientStatusObserver::STATUS_JOINING, LLVoiceClientStatusObserver::STATUS_LEFT_CHANNEL, LLVoiceClientStatusObserver::STATUS_LOGGED_IN, and LLVoiceClientStatusObserver::STATUS_LOGIN_RETRY. Referenced by LLVoiceChannelP2P::handleStatusChange(), LLVoiceChannelProximal::handleStatusChange(), LLVoiceChannelGroup::handleStatusChange(), and onChange(). Definition at line 494 of file llimpanel.cpp. References LLSingleton< LLVoiceChannelProximal >::getInstance(), and sCurrentVoiceChannel. Definition at line 361 of file llimpanel.cpp. References callStarted(), LLVoiceClient::getCurrentChannel(), LLSingleton< LLVoiceClient >::getInstance(), and mURI. Referenced by LLVoiceRemoteCtrl::draw(), LLFloaterIMPanel::draw(), LLFloaterChatterBox::draw(), LLSpeakerMgr::isVoiceActive(), LLSpeakerMgr::update(), and LLSpeakerMgr::updateSpeakerList(). Definition at line 291 of file llimpanel.cpp. References LLVoiceClientStatusObserver::BEGIN_ERROR_STATUS, handleError(), handleStatusChange(), and mURI. Definition at line 259 of file llimpanel.cpp. References activate(), deactivate(), llendl, llwarns, mCredentials, mSessionName, mState, mURI, sCurrentVoiceChannel, setState(), setURI(), STATE_NO_CHANNEL_INFO, and STATE_READY. Definition at line 472 of file llimpanel.cpp. References LLIMMgr::addSystemMessage(), gIMMgr, mNotifyArgs, mSessionID, mState, STATE_CONNECTED, STATE_HUNG_UP, and STATE_RINGING. Referenced by activate(), LLVoiceChannelProximal::deactivate(), deactivate(), getChannelInfo(), handleError(), handleStatusChange(), setChannelInfo(), and LLVoiceChannelGroup::setState(). Definition at line 465 of file llimpanel.cpp. Referenced by LLVoiceChannelP2P::LLVoiceChannelP2P(), LLVoiceChannelGroup::setChannelInfo(), setChannelInfo(), and LLVoiceChannelP2P::setSessionHandle(). Definition at line 458 of file llimpanel.cpp. Definition at line 91 of file llimpanel.h. Referenced by LLVoiceChannelGroup::activate(), LLVoiceChannelGroup::setChannelInfo(), and setChannelInfo(). Definition at line 96 of file llimpanel.h. Referenced by deactivate(), LLVoiceChannelGroup::handleError(), LLVoiceChannelP2P::handleStatusChange(), and handleStatusChange(). Definition at line 97 of file llimpanel.h. Definition at line 95 of file llimpanel.h. Referenced by LLVoiceChannelP2P::handleError(), LLVoiceChannelProximal::handleError(), LLVoiceChannelGroup::handleError(), LLVoiceChannelP2P::handleStatusChange(), handleStatusChange(), LLVoiceChannel(), LLVoiceChannelGroup::setState(), and setState(). Definition at line 92 of file llimpanel.h. Referenced by LLVoiceChannelGroup::getChannelInfo(), LLVoiceChannelGroup::handleError(), LLVoiceChannelGroup::setState(), setState(), updateSessionID(), and ~LLVoiceChannel(). Definition at line 94 of file llimpanel.h. Referenced by LLVoiceChannel(), LLVoiceChannelGroup::setChannelInfo(), and setChannelInfo(). Definition at line 93 of file llimpanel.h. Referenced by activate(), callStarted(), deactivate(), getState(), LLVoiceChannelP2P::handleStatusChange(), LLVoiceChannelGroup::setChannelInfo(), setChannelInfo(), LLVoiceChannelGroup::setState(), and setState(). Definition at line 90 of file llimpanel.h. Referenced by LLVoiceChannelGroup::activate(), isActive(), onChange(), LLVoiceChannelGroup::setChannelInfo(), setChannelInfo(), setURI(), and ~LLVoiceChannel(). Definition at line 105 of file llimpanel.h. Referenced by activate(), deactivate(), LLVoiceChannelP2P::getChannelInfo(), getChannelInfo(), getCurrentVoiceChannel(), initClass(), LLVoiceChannelGroup::setChannelInfo(), and setChannelInfo(). Definition at line 100 of file llimpanel.h. Referenced by getChannelByID(), LLVoiceChannel(), updateSessionID(), and ~LLVoiceChannel(). Definition at line 103 of file llimpanel.h. Referenced by getChannelByURI(), setURI(), and ~LLVoiceChannel().